DDI extension for CKAN for the Worldbank. Requirement: This extensions runs on CKAN 2.3 or higher. Make sure to add ddi_schema, ddi_theme and nada_harvester to ckan.plugins in your config file. If you don’t want to use the frontend-part of this extension, you can omit the ddi_theme. To use the nada_harvester, make sure the ckanext-harvest extension is installed as well. The config_file is simply the path to the DDI-specific configuration of this extension (see below). The default_license allows a user to configure a license that is used for all DDI imports, if the license is not specified explicitly. The allow_duplicates option is used to determine, if duplicate datasets are allowed or not. Duplicates are determined by the unique id_number attribute (defaults to False). With override_datasets you can specify, if you import a dataset that already exists, if a new dataset should be created or if the existing one should be overridden (defaults to False). The display and structure of the DDI fields can be configured individually. A separate YAML config file is used for that. Data can be imported either via command line or using the web interface. If you are logged in and you have the appropriate permissions, you find a new button “Import Dataset from DDI/XML” on the dataset page. This buttons leads you to an import page, where a DDI XML can either be uploaded or specified as URL. 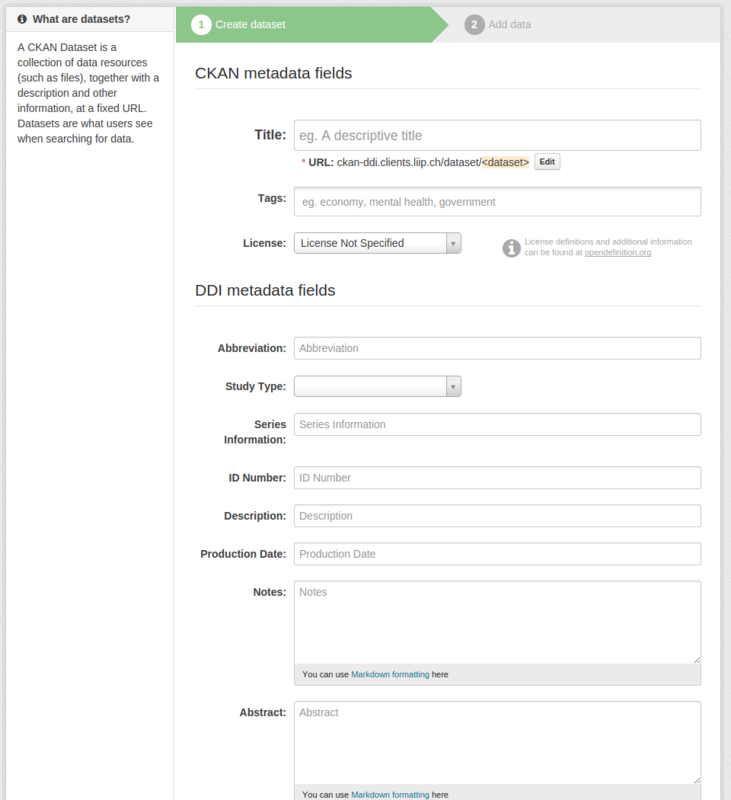 Instead of importing the DDI data, you can manually add datasets just like you would on any CKAN instance. The “Add Dataset” form is modified, so you can find all the fields from your DDI configuration (see above). This plugin provides the possibility to import DDI XML files using a paster command. <path_or_url> is a required parameter and - as the name implies - it can can either be a local file or a publicly accessible URL. <license> is an optional parameter to specify the license of the dataset. Ideally this is a value from the configured license group file. To add a harvester for a NADA instance, you should be logged in and visit /harvest on your CKAN installation (e.g. http://my.ckaninstance.org/harvest). 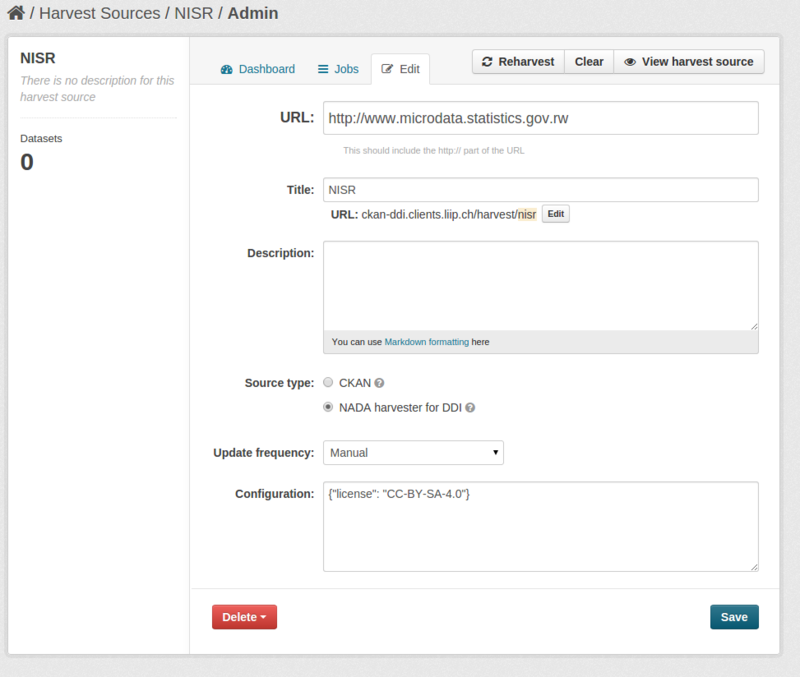 There you can add a new harvest source with the type “NADA harvester for DDI”. In the URL field, specify the base URL of your NADA instance. If the start page of your NADA instance is my.nada-instance.org/index.php/home, then please specify http://my.nada-instance.org as the URL for the harvester. license: A default license to apply to all harvested datasets (default: empty). If this is not specified the config value ckanext.ddi.default_license is used (see above). This CKAN extensions uses flake8 to ensure basic code quality. Travis CI is used to check the code for all PRs. 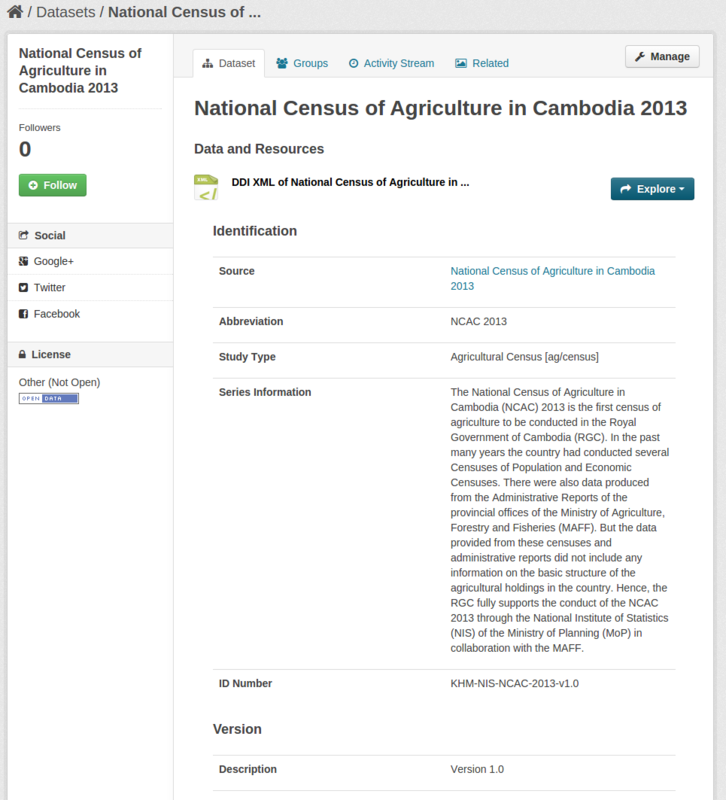 This module was developed with support from the World Bank to provide a solution for National Statistical Offices (NSOs) that need to publish data on CKAN platforms.